RS232: Standard for Communicating through serial. The UART is responsible for adjusting the voltage levels to RS232 levels correct...or can it only send TTL Serial Levels? F_CPU = 1000000UL I assume? Sidequestion: Why does the Datasheet also literally have a BAUD calculation? Ok it's not glorious code, but it's what i've gathered from just looking at the datasheet. Im a bit confused on the `UDR0` reading part......does `RXC0` get reset when we read from `UDR0`. Based off the datasheet that seems to be correct. Is this really all there is? (as far as reading the data). It seems pretty simple (which scares me, since im still new to a lot of this). From the EM-18 datasheet it's sending 10 bytes (ascii characters that are 8 bits). haven't quite figured out how i'll convert them, but this is just SUPER SIMPLE basic usage of just reading a RFID chip/device. Is this accurate hopefully for a basic setup? Has anyone used the EM-18 before (I see other RFID readers/writers but they seem super complex). I hate just using a library without understanding how it works, so hopefully im close. The max232 does the inversion and level shift - no shift registers. RS232 specifies the connector and voltages - not what is sent down the wire. 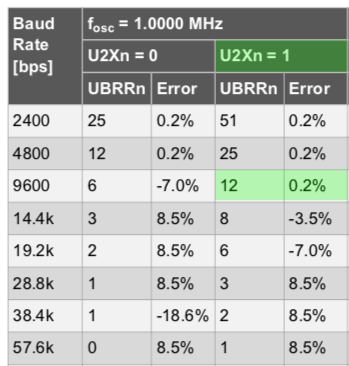 What does the data sheet say about 1MHz and 9600 baud? The error rate is way too high, this seems to catch all beginners! Also you must have an accurate and stable clock source, so be sure your using a external xtal + 2 caps on your M328 with proper fuse settings. Also did my code look...ok? Like is that all that's needed? also Kartman: I guess im thinking that the UART is what basically contains a shift register (from my understanding). So all the max232 does is basically adjust the voltage levels and send them out? the compiler knows how to split the value and which reg to write to first. Also since the default mode for the usart is 8N1, no need to mess with UCSR0C unless you need something different. 1. The MCU has a UART or USART that may be implemented in hardware or software. We like to use hardware ones, where possible, as that involve much less pain and very little code. 2. The U(S)ART connects through he MCU I/O pin structure. So, its signals, in and out are logic levels that are close to ground and close to the MCU's VCC. The Rx pin is the INPUT pin and the Tx is the OUTPUT pin. These signal/logic levels are referred to as "TTL" even though they may be far from traditional TTL logic levels because of convention and because of the arrangement of the logic levels. These signals are also inverted with respect to the normal signals on an RS232 cable. 3. RS232 level converter (MAX232 and cousins) converts between the standard RS232 logic levels (typically +12V and -12V, though it can be smaller) and TTL levels appropriate for the input and output of a U(S)ART. The level converter also inverts. Note that the converter Tx pin is the CONVERTER'S output and must be connected to the U(S)ART's Rx pin. Likewise, for the converter's Rx pin and the U(S)ART's Tx pin. A converter requires a source of power and usually has a built-n charge pump power supply (usually needs several external caps) to get the +12V/-12V needed for the RS232 signals. There is also a ground connection REQUIRED between the MCU/U(S)ART and the level converter. 4, The same, or equivalent is needed at the other end of the RS232 cable. RS232 devices with a DB9 or DB25 connector can be assumed to have standard RS232 logic levels. You DO have to pay attention to the receive and transmit at each end of the cable. Typically, the receive of one end become transmit at the other. There must also be a common or ground wire in the cable, connecting at both ends. That signal MUST be connected to the level converter's ground. 5. The RS232 standard says nothing about the format of the data on the cable or even that it is asynchronous serial (and certainly not details like baud rates). Technically, the RS232 spec only addresses on-cable logic levels, secondary signalling (e.g. RTS, DTS, and such) and connectors, including pin-out. Nicely done Jim, maybe this needs to be a sticky! Awesome info, thanks all! Also with the U2X bit set, do I need to do anything fancy with reading/writing? or literally set it and forget it. Think of U2X as just one more "bit" of UBRR. Set it and forget it.